MUFF WIGGLER :: View topic - Why are internal LFOs so common in phasers? Why are internal LFOs so common in phasers? Does anyone know why this is common? Because without an LFO there is no phasing effect? Seriously. It would be like selling a chorus effect that didn't include an internal delay circuit. I'd say it's more like a chorus effect without an LFO. In either case, there is a static delay/shift. My DIY phaser has no internal modulation. My chorus does, but only because JH put it on the PCB. There is no reason to limit these effects to periodic modulation. It's not a guitar pedalboard. Doepfer's A-101-3 (and maybe lesser models) has no internal LFO if that's what you're in the market for. As far as I can see all the ones you linked also have CV inputs for the center frequency (only have experience with the SPH2, no idea what the mod ins on the EMW is), so what's the problem? it's part of what makes the 101-3 so appealing to me. It would still be nice to be able to bypass the lfo. Looks like (…) XAOC don't have a depth control? There are Rate and Depth knobs within the internal LFO section on the Kamieniec. ooohh, the LFO OUT is a nice touch! The circuit may be cheap, but the panel controls require extra HP. I have lots of external modulation, but not a lot of free space. I've got the EMW Phaser 4 and I can just turn the Depth to zero and put CV into the Mod In's. I find that it is interesting to crack the LFO depth just a bit to get more randomness to the main CV. The reason for having an internal LFO in phasers may be that often the waveform of the LFO has a special shape optimized for the particular phasing circuit. Depending on the technology (e.g. FETs or vactrols) an optimal LFO may be a hyper-triangular or some other unique shape that takes into account the highly nonlinear response of these elements. Hyper-triangular is rather uncommon in a modular environment and would require several extra modules to replicate. I've seen many demos of modular phasers on youtube which sound bad or uninspiring, because an inappropriate external modulation has been patched in. Sorry, but I strongly disagree. If it never stops, then there is nothing interesting going on. Static phase shifters are useful. Stepped modulation, manual adjustments, envelopes, audio and other CV sources are useful. I prefer to use my shifter as a complex filter rather than that ceaseless swoosh-swish. Well I just got the Schippman phaser and it has No modulation on board. Initially I was like but I guess it's more interesting to patch something else in to do modulation. I guess it's more interesting to patch something else in to do modulation. Having an onboard LFO doesn't prevent you from doing so. It gives you more options, not less. I agree, I was slightly disappointed tbh but having spent that kind of money on it I'm trying to stay positive about it! I've used the Schippmann a lot without any modulation so I've never missed it. OTOH I had it hooked up to a syncable LFO the other night so I could use it as a rhythmic effect with drum sounds. From what I can tell a phaser is nothing but a (5-10ms)-delay (or several) put onto the original signal, thus through the shift in phase and resulting phasecancellation (combfilterlike) creating the typical sound. Like already mentioned the effect would be static if it was just for that, then the LFO modulating the delaytime is responsible for the characteristic wandering. What does the Rate knob do when using external modulation? I assume the Depth knob attenuates. Really wish it was 8 HP... doesn't look like the ergonomics would suffer, and I'm not ready to take the odd-numbered-HP plunge. The RATE and DEPTH knobs affect only the internal LFO. The sensitivity of the EXT MOD input is fixed at 1V/oct. This allows turning the internal modulation off while still having a full range modulation by external sources, as well as mixing both both modulations to your taste. The internal oscillator is also scaled to 1V/oct and goes up to audio range, thus it may be used for additional FM coloration of the phaser effect. There is a constant source of confusion since almost day one of phasers. One can get into some finer points of argument, but there is no question that a flanger is delay based and a phaser is all pass filter based. Phasers historically were meant to be a tapeless simulation of tape based flanging effects but it was soon realized that the effect was different as to the frequencies involved at any time in the cycle. Wasn't phaser intended as a Leslie emulation? The Uni-Vibe was intended as a Leslie effect, and is a simple phase shifter. Aah yes, I see, wasn´t familiar with this specific difference though phaseshifting through an allpass-filter has been familiar and I remember it being mentioned in that context. Basic sense of the LFO modulation principle, wether it´s a phaser or flanger, still applies for answering the original posed question, reason an LFO is usually implemented in both. i understand a modular phaser having an LFO if that is specific to the clone or the designer's intent, so that's what was desired, but the ability to override it is huge. Personally, I've never cared for LFO's much, at least fast enough to notice, and that's what put me off of phasers for a while. I don't hate that sound, but it always has *that sound* and that is the LFO. After realizing that phasers are amazing! in feedback loops with crazy CV, just tweaking... they are endless, yet with an LFO the felt like a gimmicky and limited effect. Short delays are one way to create a phaser, but the classic method is the "all pass" filter. That's because delays are expensive (now) or unobtainable (20 years ago) compared to all-pass networks, which require just one op-amp stage, three resistors, and a capacitor (see the wikipedia article). Are there any Allpass-Filter Units in Eurorack-Land? in a Synthesizer, that I know of, is the Oberheim Xpander/Matrix 12. I've even often heard this extremely confusing explanation: flanger is delay, phaser is extremely short delay. As stated, delay-based comb-filtering is called flanger. Phaser is built around an all-pass-filter. A simple delay is an allpass filter as well. The important property is that its phase response is linearly proportional to frequency. I respectfully disagree here. A short delay is much easier and cheaper to build: a BBD line is just a single chip, as it was 20 years ago. Indeed, it was unavailable in the 1960's, that is why filter-based delays were the dominant option. Both the flanger and phaser effects are based on similar principle - the delayed signal is mixed with the original, which creates a series of notches in the frequency response, that correspond to frequencies where the delay creates a 180 degree phase difference which yields phase cancellation. Thus, both these effects may be classified as comb filters. I believe the main difference between the sound of a phaser and flanger is related to the way the notches in frequency response are distributed along the frequency axis. In a flanger, the distribution is linear due to linear phase response, i.e. they create a harmonic pattern. Thus, the cancellation makes a certain periodic signal with all its overtones to be cancelled at the same time and this yields the characteristic metalic sound of a flanger. In a phaser, the phase response is usually nonlinear, beacuse it is a result of accumulated nonlinear phase responses of each individual filter stage (that typically resembles the arc tan function of frequency). After mixing with the original signal, phase cancellation occurs at a series of frequencies that are not related harmonically. There is some variety of phaser sounds which is a result of how these notches are distributed, and this is related to how the individual filter stages are tuned wrt each other. Note that in a flanger, the number of notches is only limited by the audible frequency range and all they are created by a single delay. In a phaser, the number of notches is related to the number of stages divided by two, which is a result of the shape of the phase response arc tan curve. A combination of these two could be an interesting and powerfull effect. I wonder, how much the appeal of high-order phase shifters (the particular fluid-like timbral effect) is related to the increased number of notches and how much of it depends on the Doppler frequency shift related to the modulation of the group delay. The clue may be in the increased similarity to the timbre of a flanger, which is also attributed to the Doppler effect. Having worked in a lab where we actually used the Reticon BBD arrays for Real Stuff (not audio), I respectfully disagree. at $BIGCORP and working on $DEFENSEPROJECT, otherwise it would have been years. at once, rather than the one-at-a-time of an all-pass. bandlimited (and also frequency-shifted; that's part of the magic). One can pretty easily get an allpass response from any 2-pole (12dB/octave) state variable filter, by mixing the original (input) signal with 2x amplified bandpass output. OTOH, if you want a notch (band-reject) response, mix them with 1:1 ratio. Adding is required, not subtracting, due to the phase shift introduced by the filter. A lot of '80s analog synths used that chip but most of them didn't bother with the all pass. I've got a small handful of those chips and have a modular design with each pole switchable between LP, HP, and AP. Too bad those chips are so rare and expensive. A lot of '80s analog synths used that chip but most of them didn't bother with the all pass. TBH I can't think of too many examples where an all-pass filter would be very musically useful in a typical *standard* fixed VCO-VCF-VCA synthesizer architecture. I might be wrong (probably am, actually), but wouldn't it be "just a phase shift"? If so, not terribly useful to me at first glance. All pass filters are of course potentially useful in *combinations*, such as if there is a feedback loop, or if it the APFed signal was mixed either with the unmodified signal or a parallel APF route. Perfect, in other words, for modular type experimenting. Vibrato is a good application for APFs. Aside from that, feedback loops are great. Can you explain the vibrato patch? This is an application that does call for cyclic modulation, or at least a signal that remains in motion. It usually requires just a couple of 100% wet allpass stages in series. Luckily, you can do that with one op-amp (I think). That sounds like just a phaser then and if anything, a tremolo effect. Vibrato can only come from modulating an oscillator. That isn't true. Vibrato can be applied to an input by modulating allpass filters or delay lines. Hmm..I will have to try it but I don't understand how filtering can change the harmonic structure. The delay lines, yes, you will get pitch shifting. The word "filter" is throwing you off. Rather, think of it as phase modulation and consider the relationship between phase and frequency. This is how true vibrato circuits have been around since the 50's. Hmm..I will have to try it but I don't understand how filtering can change the harmonic structure. All pass filters change the phase of a signal; if modulated with a LFO, yes, there would be an "apparent" slowdown and increase in the frequency. Hadn't thought of that application before. Again, not so useful on your typical "standard" synth architecture (since you can just change pitch directly and depending on the synth, filter modulation options may not be so great), but useful in more modular applications or maybe even a more complex synth like the Matrix 12 (such as processing external signals or feeding the APF interesting shapes to modulate). Okay..trying to assimilate everything. Someone before likened APF to frequency shifting which would make sense since these are non-linear phase shifts. The linear phase shift of a delay line would give pitch shifting. Regardless of easier methods of vibrato, it is all food for thought and important to understand. Thanks guys. Nonlinear phase response means that the delay introduced by the unit is frequency dependend, or dispersive. In other words, different spectral components are delayed by a different amount of time. Frequency shifting appears only when the phase response (or delay) changes over time, i.e. when the allpas filter is modulated in a continuous way. Yup, that all makes sense. Now I understand that I wasn't crazy for thinking certain sounds I put through a phaser sounded not quite out-of-tune but off somehow. Uh, no. In many ways. phase, and cancels itself to zero in the final mix. 1500 Hz shifts 540 degrees (1.5 times around the circle) and so is the same as 180 degrees of phase shift, and cancels itself to zero. That's why delay lines are equivalent to comb filters in the steady state. phase-flat because the all-pass is designed to reverse the shift of the low- or high-pass). power spectrums, not just voltage. The delay line will only shift frequency if the time delay is modulated; constant time delay lines don't shift frequency. interestingly, also how green laser pointers work. infrared laser input. A filter then removes the eye-damaging infrared and what you have left is a green laser. So that's why a green laser pointer is like a guitar pedal. I'm sorry, but you have it all mixed up. First off, delay line does not have linear phase shift. Pure delay lines do have linear phase response, because phase response by definition is the product of delay and frequency. If delay is constant for all frequencies (e.g. a non-dispersive delay), the phase response is linear. But anyways, we are talking about phasers here, which are build from a chain of allpass sections, not delay lines. Analog allpass filters do have nonlinear phase response, and they are certainly dispersive. or any textbook on analog filter design. As to frequency _shifting_ - no, a filter never shifts energy from one frequency to another. You are assuming a linear time invariant filter here, which is not the case for phasers that are modulated filters. Modulation is the key to varying group delay of the filter, and this yields frequency shift, quite simply demonstrated by Doppler. Actually, it's not. A delay line has a flat amplitude response. 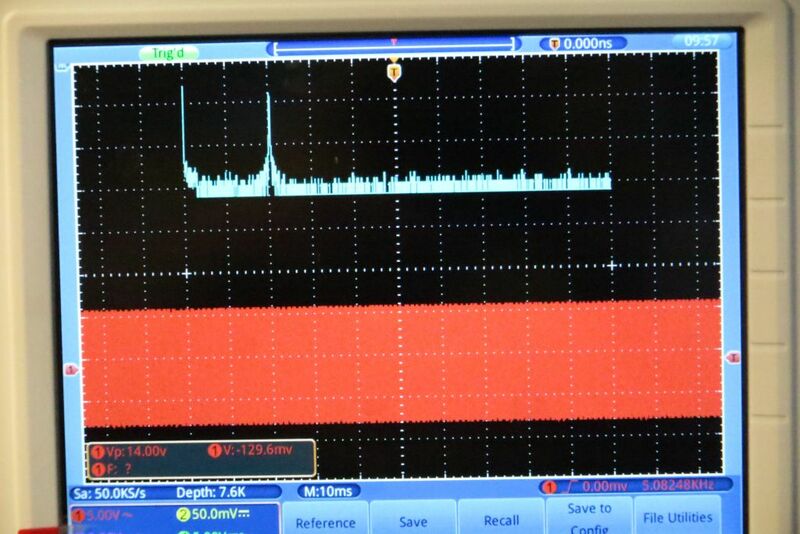 In order to get a comb filter you need to mix the delayed signal with the original. And such a structure is not a delay line, but a filter. I´m not too much into all that technical stuff here, then, of course you would have to mix the delayed signal with the original one, otherwise it would merely be a delayed signal, while the phasecancellation can only happen when the shifted phase signal is put against the original phase. Basically any simple delay with let´s say dry/wet at 50% and a few miliseconds delay time creates that basic flanging/phasing sound though without movement (combfilter), hence an LFO to modulate the delaytime for wandering. But you can't hear the difference between 0 degrees and 360 degrees; the trick is that the signal out _always_ undergoes phase unwrapping and so the phase response looks like a sawtooth, not a linear ramp. and PhDs in that today for how to do it with less loss of information and fewer phase unwrapping errors. would say. You have to go way out of your way to make a filter that isn't dispersive (i.e. adding a post-allpass with the inverse phase response). would technically "have" a frequency-shifting filter. But I'd call shenanigans on that. I disagree. Phase unwrapping is a purely computational problem that is encountered mainly in processing of discrete (sampled) data (like in your SAR example). In the analog continuous world, group delay (the physical delay that may be observed on a scope using a transient signal as oposed to a purely theoretical sinusoid) is by definition the derivative of phase over frequency. If phase was not a continuous linear function, the derivative would have spikes and certain spectral components would have an infinite group delay. Nothing of that is observed for a normal delay. Certainly, you can't hear a difference between 0 and 360 degrees. That is why you get a comb filter with multiple (infinite number of) notches by mixing the original signal with its delayed copy, because the cancellation ocurs at multiple frequencies (as oposed to a single notch you get from two pole analog allpass filter when mixed with the original, which explains why we need a whole chain of such filters to achieve the desirable efect of multiple notches in a phaser effect). But this (not hearing the difference) does not invalidate the property of linear phase. Every textbook on signal and system theory I know treats a simple delay as a linear phase device. Plese, do not re-invent the whole discipline without a solid reason. I really can't get your examples involving green lasers, synchronous motors or tuning forks. I'm a classically trained electronic engineer, and we should talk about electronic circuits here, because synthesizer modules are electronic circuits. I can barely imagine an analog electronic filter that would not use capacitors or inductors, and these elements are known from their capabilities of storing energy. Hence, yes all the allpass filters used for constructing a phaser effect store some energy in their internal state. In fact, it would not be possible to physically delay any signal without some form of energy storage. Still, I can't see your point in stating that energy storage is necessary for frequency change. As I have already mentioned, there is some form of modulation taking place in a phaser driven by the LFO. From the properties of Fourier transform, modulating a signal often results in shifting in frequency domain. It shouldn't be surprising the result is an audible detuning. From my observation, the longer is the chain of allpass stages in a phaser, the more radical is the frequency shift. Quite true- if your listener is a ADC and some software, then you are entirely correct. bothers buddies of mine when they play too much Half-Life. Okay. Let's do the actual real-life experiment. No surprises; the output is still a clean 5 KHz sine wave. Finally, the "test", of an Oakley Deep Equinoxe VC Phaser, 8 stages, on the local VCO. Conclusion: experimentally, neither the "normal" filter nor a phaser add or shift frequencies. wavefolder or Discontinuity or distortion pedal also -will- add frequencies. EDIT: Looking at the last two plots above, I noticed that the peaks do not _precisely_ align on 5 KHz. So I carefully let things warm up a while more to thermally stabilize, and checked again. The peaks stayed put, right where they should be. First of all, you are measuring a wrong signal. 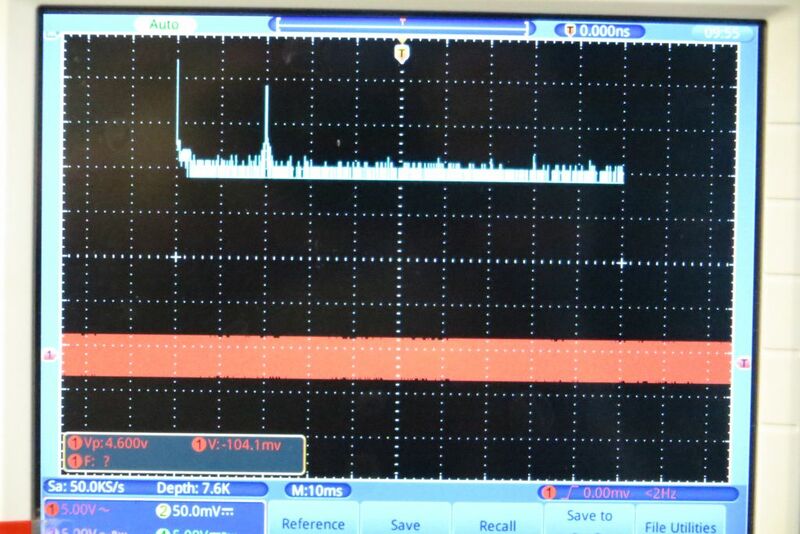 It's the output of the allpass filter what should be measured, not the result of mixing this output with the original. After mixing, there is a cancellation effect in that every two spectral lines of close frequency (the original and shifted) are equivalent to a single sinusoid multiplied by another one of the differential frequency (the so called beating effect which we perceive as the notch in spectrum moving up and down). Furthermore, you are using an inapropriate tool for this experiment. 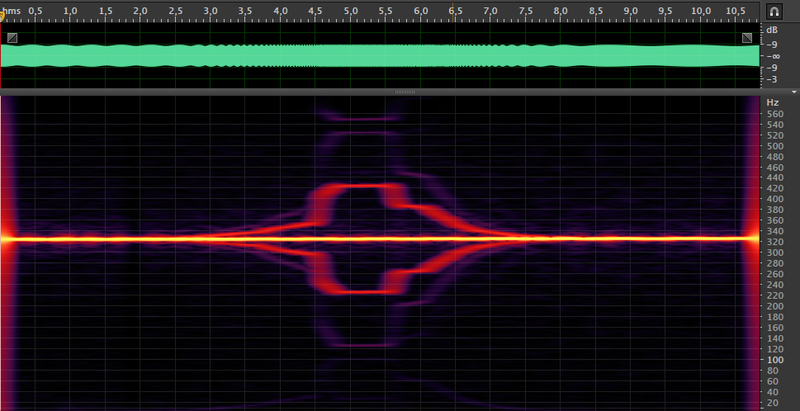 The modulation frequency is a few Hz only and this is the amount of frequency shift. The spectral resolution of your analyser is far too low to observe it. At this sample rate you would need at least a 64k FFT to see the difference, and also the screen resolution would have to be in the range of 50k pixels. 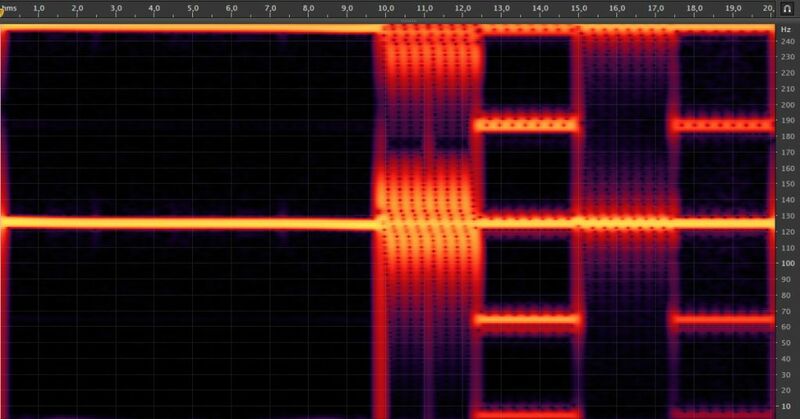 It would be much more reasonable to use a computer and a hires spectrogram tool with zoom. I don't have a phaser on my bench at this moment. But I can easily prove the frequency shift in a modulated filter. 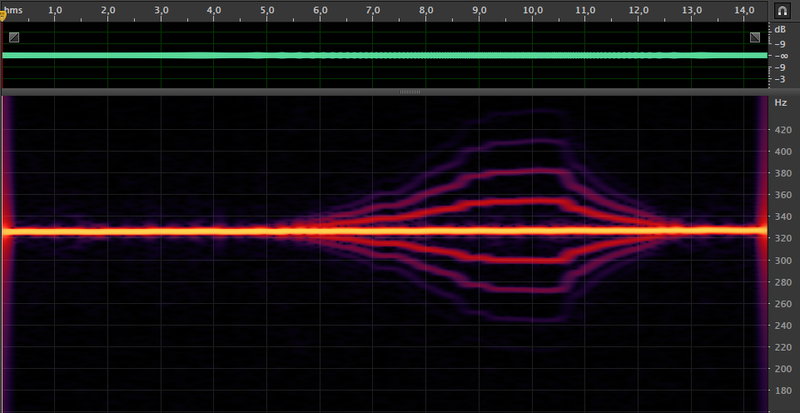 Below is a spectrogram analysis of the output of a 12db/oct lowpass filter processing a fixed frequency sawtooth signal. The cutoff frequency of this filter is modulated by a sinusoidal LFO with manually controlled rate, starting from slow oscillations (about 1Hz) and increasing up to 500Hz, then decreasing. 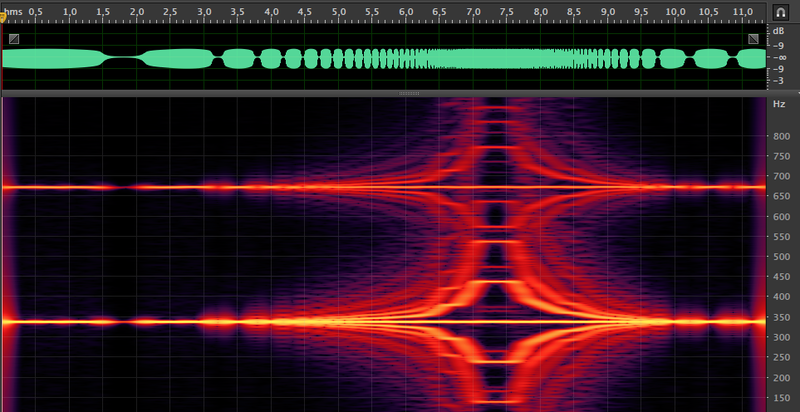 The spectrogram resolution was 16384 points (the limit od Adobe Audition) which is barely sufficient to see the effect at 1Hz (the sidebands of each harmonic partial are very clearly changing synchronously with the modulation). At the increased rate of the LFO there is apparent effect of frequency modulation and the spectrum is seamingly consisting of many products of this modulation. If you insist, I can perform the instantaneous frequency analysis in Matlab, to show exactly that the signal has a varying frequency in every harmonic partial. PS. Chains of allpass filters were often used to create the vibrato effect (pitch modulation) in many electronic and electro-mechanical instruments long before CCD/BBD delay lines were invented. The effect of frequency change is clearly audible there. Well, I disagree... but may I suggest that you do the next round of experiments? You clearly have (or have access to) the proper equipment. So do it, take photos, and post your results! not new frequency introduction and definitely not the aharmonic series as generated by the wavefolder shown above.. I understand my previous example may be not that clear, because the filter cutoff frequency was deeply modulated and the resulting deep amplitude modulation may have masked the effects of frequency modulation. Here is a second take. Now the signal to the VCO is almost a clean sinusoid, and the modulation depth is very shallow so that it almost does not affect the amplitude. Of course it also means that the FM depth is reduced, but the instantaneous frequency analysis is very capable of detecting even slight modulations. Now the instantaneous frequency shows clearly the periodic pattern of frequency changing according to the LFO action. The right plot is a zoomed detail from the middle segment, where the LFO frequency was increased. Ok, so then, do me a favor and do the exact same experiment but with a VCA in there instead of the phaser. 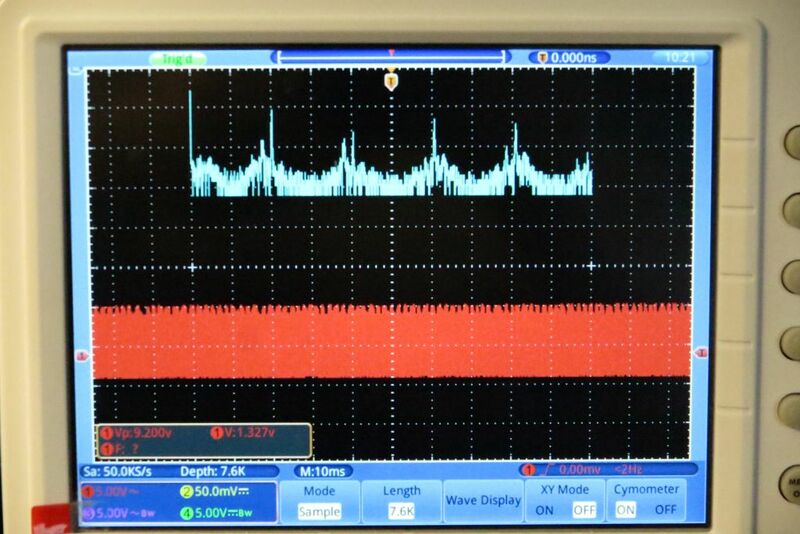 That way, we can see if the AM of a fast modulated VCA (sum and difference generation) is distinguishable from the passband / stopband motion in a phaser. Please, note that I didn't do phaser analysis, but a simple 2-pole lowpass filter. As I said, I didn't have a long allpass filter on my bench at that moment. What can be observed from the comparison of the "deep" case (1st filter vs 1st VCA) is that in pure amplitude modulation the sidelobes of harmonic partials are purely symmetric, while in the filter output they were clearly balancing from one side of the main lobe to the other side. What can be observed from the comparison of the "shallow" case (2nd filter example vs 2nd VCA example) is that the harmonic spectrum of the modulation product is much cleaner in the AM case. This is quite easily explained by the modulation theorem: the result of amplitude modulating a sinusoid by another sinusoid (the LFO waveform) is just the sum and difference frequencies. The spectra of FM signals are much more complex (recal FM synthesis). And indeed, in the modulated filter output we observe a whole harmonic series of Bessel spectra. Once again: modulated allpass filters were commonly used for achieving vibrato (frequency modulation) in early electronic and electro-mechanical organs. The frequency modulation effect was clearly audible. Are you going to deny this fact? clue how they were used except it was to make chords not "sound crappy"). so why am I seeing two each above? generates a whole harmonic series itself) and then using that as the modulator. saw (stepping around but maxing out at about 100 Hz). Google up "Hammond vibrato scanner", patents are readily available. It's basically a multitap allpass filter and a mechanical or optical multiplexer that scans the taps. 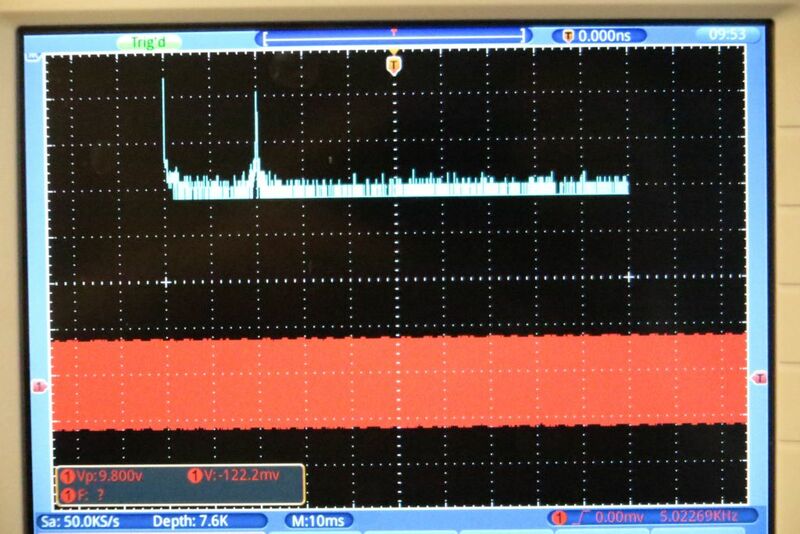 Yes, I was using an exponential control input for the filter, but not 1V/oct. I had to attenuate the LFO in order to reduce the amplitude modulation in my second example. A much better example would be to use a multi-stage allpas filter, because a flat magnitude response would allow to get rid of the amplitude modulation effects and focus on phase modulation. As I said, I don't have one at the bench right now. My LFO in all experiments was a sinsusoidal, not sawtooth. Yeah, but it's going in through an exponential input, so it'll end up having a lot of other frequency components as well. the control signal. Of course, if the control signal is constant, then the derivative is zero, which means "no FM, carrier out = carrier in". Now I can see the usefulness of the Schippmann phaser. You can select from 2-16 stages. I imagine the 2-stage would sound great with audiorate modulation. I believe that this definitely proves my earlier point: it is possible to change the frequency of a signal by modulating a filter. There are phasers with voltage controlled LFOs which counts as VCO. The notion of "bad sounding" is a very ambigous thing, especially in the context of modular environment. I very much like the sound of exponential audio rate modulation in a phaser.